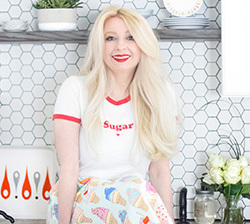 Say hello to my new favorite summertime dessert! 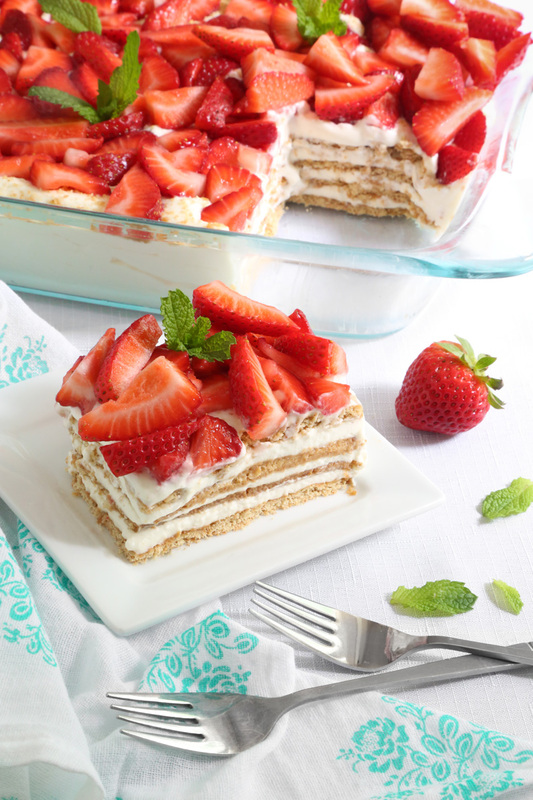 This icebox cake is no-bake and uses only five ingredients. You can throw it together in about 15 minutes and after a short chill in the refrigerator it's ready to be enjoyed. You can top it with any kind of berry or fresh fruit that strikes your fancy, but right now is a great time to take advantage of all the bright red, fat, sweet strawberries that line the shelves of grocery stores and farmer's markets tables alike. My favorite graham crackers are made with honey. They have a touch more sweetness than regular grahams and I recommend using them in this recipe. I think chocolate grahams would be wonderful in this dessert too. I plan to try that next time, perhaps with a drizzle of chocolate syrup on top of the strawberries..? Yes? I think yes. I made a short video (less than a minute long!) to show you exactly how to make it at home! As the assembled dessert chills, the graham crackers become soft and cakey. The texture is almost cloud-like. It's a real crowd-pleaser so your potlucks and picnics are covered! I have romantic feelings about this GIF. You'll use an entire box of graham crackers for this recipe, and I'm only telling you that just case you have a sneaky graham cracker snacker in your house. (I am that person.) I used about a pound of sliced berries on top, but you can use more or less to your taste. Please note! The dish I used is 13x9 across the top but the bottom of the dish measures slightly smaller (11 1/2 x 7 1/2). You may need slightly more graham crackers to get all 4 layers if you have a pan with straight sides, or you may choose to just make 3 layers instead. Here is the dish I used for reference. Beat the heavy cream in a large bowl with an electric mixer on high speed. When the mixture starts to thicken, gradually pour the sweetened condensed milk. Add it into the bowl in a steady stream as you continue to mix. When the milk is incorporated, mix in the cream cheese one cube at a time. Beat the mixture until it is thick and fluffy. 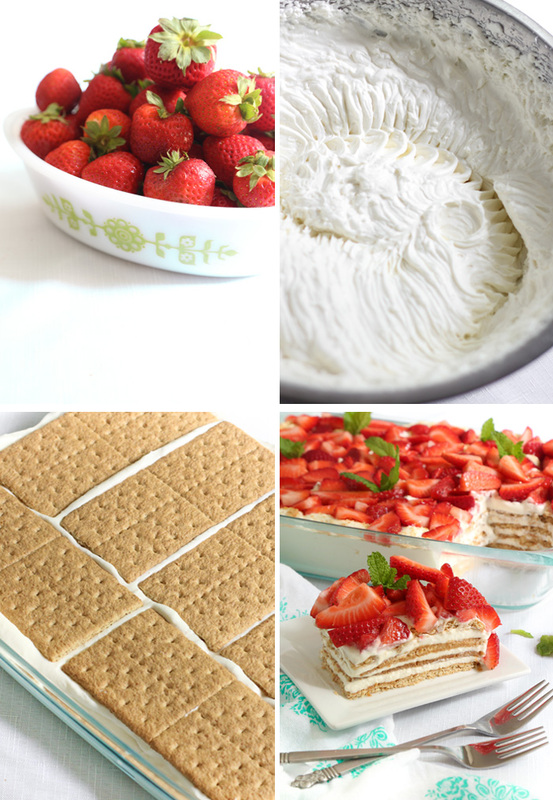 Line the bottom of a 13x9-inch baking dish with a single layer of graham crackers. You’ll use six full graham cracker sheets and one half sheet broken down the center horizontally (see video). Pour on a generous 1 1/2 cups of the cheesecake mixture and spread it over the crackers evenly. Add another layer of graham crackers and top with another 1 1/2 cups of cheesecake mixture. Repeat this step twice more until all of the cheesecake mixture is used. After layering the ingredients you’ll have 1/2 graham cracker left over. Put it in a zip top bag and crush the crackers to crumbs with a rolling pin or your hands. 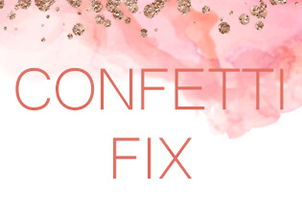 Sprinkle the crumbs over the top of the dessert. Scatter the sliced strawberries on top of the dessert and cover with plastic wrap. 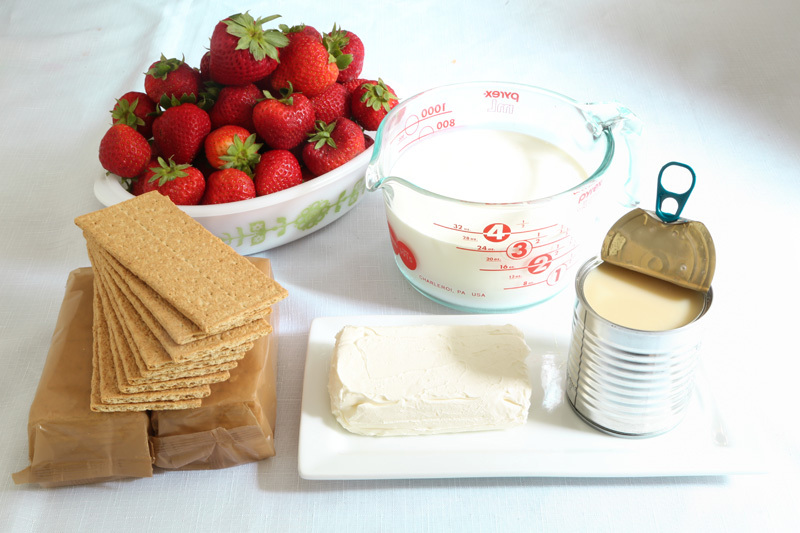 Chill in the refrigerator for 2 hours, or until the graham crackers have softened (you can check this with a fork, the fork should glide through the dessert with no resistance from the graham crackers). Garnish with mint sprigs if desired. Store leftovers in the refrigerator. 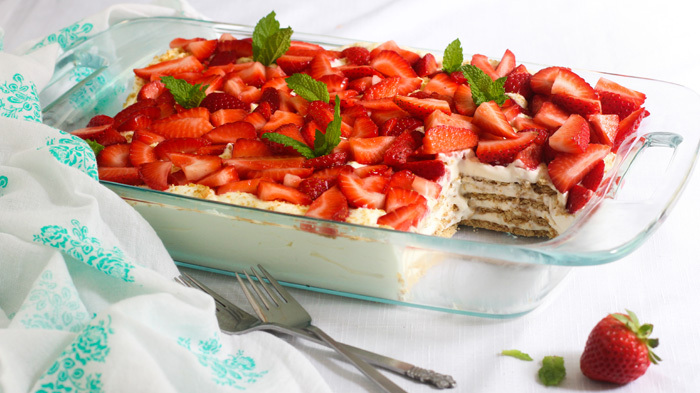 This dessert keeps well for up to 4 days in the refrigerator. A great idea and heavenly dessert! Looks really easy to make... and has wonderful colours! Mmm... Looks so delicious! YUM! I made this in a 13 x 9 metal baking pan as my glass dish went AWOL. It took a lot more crackers then indicated. I only got 3 layers and barely. Well that's weird! Are you sure the metal pan wasn't 18x12? Hi again Rod, it seems my pan is 13x9 inches across the top but slightly smaller at the base. The edges flare a bit. I think this is why you only got three layers and I got 4. I've updated the recipe with a headnote. Thank you for your feedback! In Bulgaria this cake is called biscuit cake and the recipe is very old. I can't even begin to describe how amazing this looks. I would really like to make this for one of my neighbours one day. I am a little confused. If graham crackers are 5x2.5 then it appears your pan is only 11 x 7.5? Not 9x13? I am wondering if I only have a true 9x13 pan I will need more than a box of the crackers and if I will not be able to have as many layers. I enjoy your blog so much! 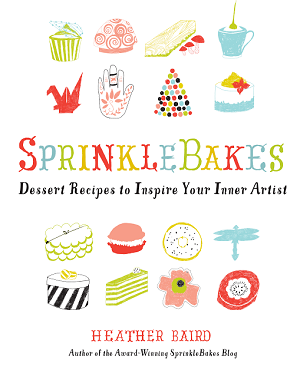 You have amazing recipes, most of which intimidate the life out of me, but are so inspiring to look at! I just measured my dish to be extra, EXTRA sure, and it is 13x9-inches at the top edge. BUT! It has rounded corners at the bottom and the sides flare out a little bit, so the bottom of the dish measures 11 1/2 x 7 1/2. Following is a link to the dish I made it in. My advice is to have extra graham crackers for 13x9-inch pans with straight sides. Thanks for your question! This solves the mystery of folks only getting three graham layers. I'm going to note this in the blog post. Perfect!! I was searching for an easy recipe that uses STRAWBERRIES!! Thank you. This was easy to make and even of my fussier guests enjoyed this delicious treat. Mmm. I made this yesterday and it was FABBBB. I cut it in half, and it worked perfectly in my 10x7 Le Creuset.. While I was making it... I was thinking about how perfectly it could even be tweaked to be 'on the healthy side' with a lovely thick yogurt. 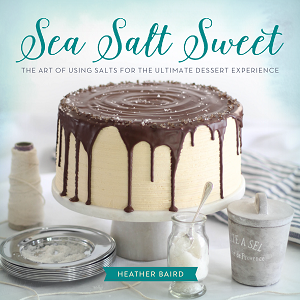 But either way - it is perfect for a light, sweet, summertime treat! I think that's a wonderful idea! Right now I'm loving strained Greek yogurt for a cream cheese stand-in. Let me know if you give the yogurt a try! Thank you for the delicious recipe! I made it for my 30th birthday and it was perfect! 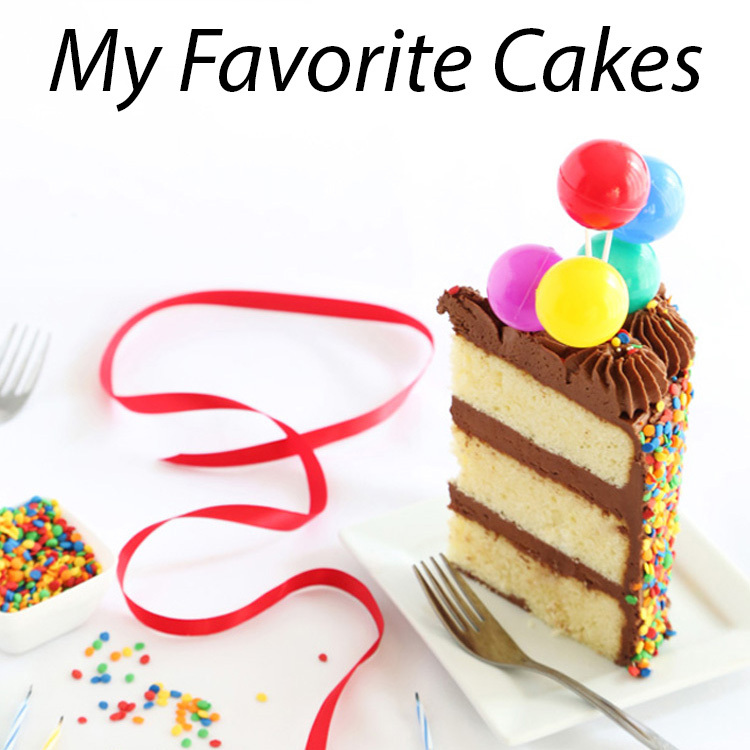 I've never made an icebox cake before, and I'm really not sure why. This one's a stunner and mixes so many of my favorite ingredients. I'm pretty sure my husband would eat the whole pan in one sitting! I made this for the 4th of July and it was a huge success! I layered blueberries and strawberries for the red, white a blue effect and it was absolutely delicious. Can I make this in individual cups?